Broadly speaking harnesses can be placed in one of three categories. If using a front attachment harness understand that a dog’s rib cage is not supported with the stabilization of collarbones so you need to minimize substantial torquing forces. When selecting a harness choose a properly designed “Y” harness. The “Y” harness has “straps that fit tightly around each side of the dog’s neck, almost like a collar, and meet a third strap that runs under the dog's chest. (See fitting guide on right)The point at which the neck and chest meet forms a "Y" that sits right on the manubrium - the part of the sternum (chest bone) that is closest to the front of the dog.” The “Y” harness places the majority of the pressure from the harness “on the manubrium, which is a very stable bone that supports the entire dog's body.” The neck straps should be snug so they do not slip down and put pressure on the shoulders. “No part of the harness should “cross over the dog's shoulder blade (scapula) or upper arm (humerus)”. A properly designed and well-fitted harness does not have restrictive straps that sit on top the biceps and supraspinatus tendons. A harness should permit the dog’s legs to have full range of motion to extend forward and reach back unrestricted. The girth strap should be fitted about 2” behind the front legs so it’s not pushing into the elbows. You would not wear a poorly fitted jacket, backpack, safety harness, or shoes, so don’t subject your dog to an improper or poorly fitted harness. NECK STRAP SHOULD BE ABOVE THE SHOULDERS AND GIRTH STRAP ABOUT 2" BEHIND FRONT LEGS. How to train a dog to Walk on a Leash Without Pulling. "No-pull” restrictive type of harness are potentially damaging to the front legs. 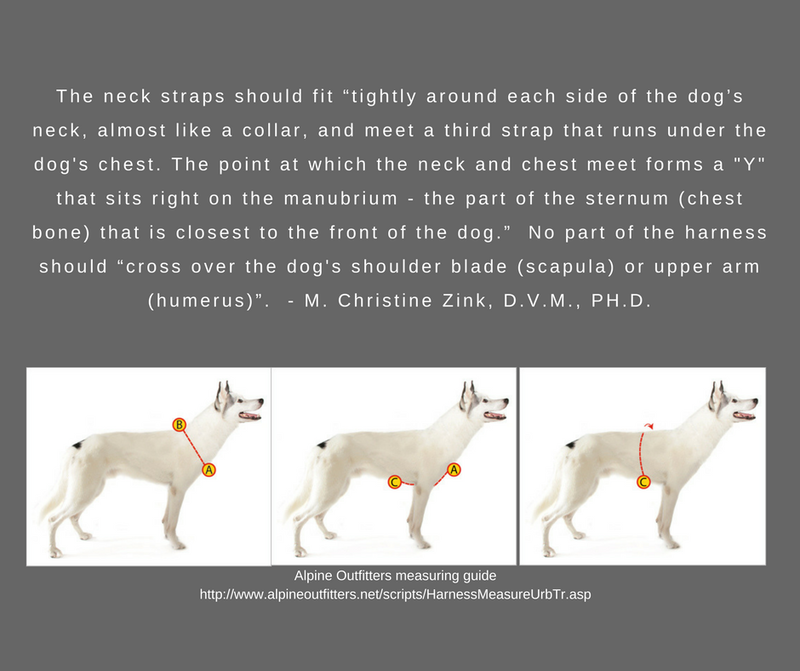 As a specialist in canine sports medicine Dr. M. Christine Zink* has significant concerns about the use of harnesses that wrap around the front of dog’s forelegs. 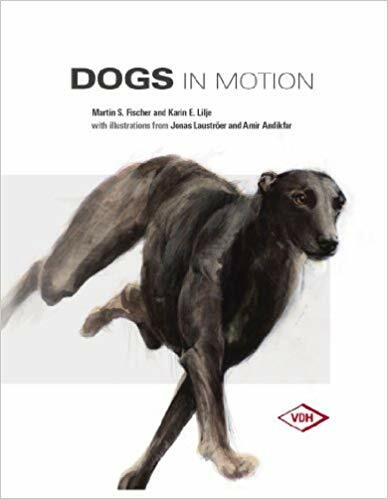 (Whole Dog Journal May 2013) Dr. Chris Zink should be releasing her “limited gait analysis study” sometime in the near future which will address concerns with these types of harness. The Urban Trail Half Harness is perfect for use in a variety of dog activities in addition to mushing, such as scootering, bikejoring, roller blading, canicross, skijoring, tracking, and hiking. This harness works equally well for walks around the neighborhood. This harness extends only part way down the back to accommodate the steeper pull angle associated with biking and scootering. Fully padded with premium quality Polartec Polar Fleece and is extremely lightweight, durable, and is machine washable. Contrary to appearance and perception, Polar Fleece does not readily absorb moisture; due to its hydrophobic nature, it only retains 1% of its weight in water. The Howling Dog Alaska Distance Harness is the harness of choice for skijoring, bikejoring, canicross, scootering and dog trekking. It is an ideal harness for the use with BTL and Springer bike attachment. The Distance Harness only reaches about 1/3 down the dog's body, which eliminates the pressure on the dog's hips while pulling. Therefore it makes this harness an excellent choice of a harness for any dog with lower back problems. Crabbing dogs (dogs running sideways) will straighten out. Our harness comes highly recommended by Wes Rau, top canine physical therapist. Blue-9 Balance Harness (non-restrictive). https://www.blue-9.com/pages/balance-harness/ The Blue-9 Balance Harness was appropriately designed taking canine anatomy into consideration. Fitted properly the harness neck straps fit around the neck so they do not slip and put pressure on the shoulders. The Balance Harness does not have restrictive straps that sit on top the biceps and supraspinatus tendons potentially damaging the front legs.